Today we’re excited to announce that we’ve raised a $12 million Series A round from Andreessen Horowitz, together with our awesome existing investors: Bloomberg Beta, Designer Fund, and Tank Hill Ventures. Netlify gives developers an instant setup for deploying and collaborating on modern frontend web projects. It just takes a few seconds to link a Git repository to Netlify and get a production-ready site, with an automated workflow that turns every pull request into a staging environment. Single Page Apps, Static Site Generators, Progressive Web Apps, React, Vue, Yarn, npm, Webpack, Babel, Hugo, Gatsby and the like are all part of the immense list of tools that have exploded onto the frontend programming scene in recent years. They represent a massive trend towards decoupling the frontend and backend. This has transformed the role of the frontend developer from someone who would mainly slice and dice a design from a PSD into a full blown app developer. On the backend side of things, we’re seeing a strong trend to split large monolithic applications into microservices where each service has a much smaller surface area. We’ve seen a huge surge in tools for managing, monitoring, and orchestrating microservices to solve the new problems that have emerged as developers started decoupling the individual parts of their monoliths. 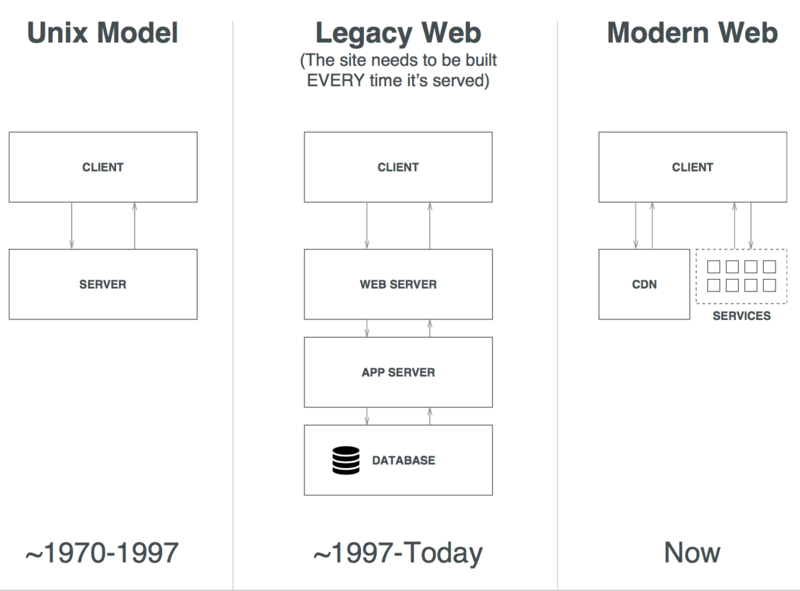 Netlify is our attempt at bringing the web into the era of microservices by creating a coherent workflow around a decoupled web, based on the principles of the JAMstack. Decoupling is something we always strive to accomplish as developers. It’s a way to let us isolate smaller units that we can reason about and a way to construct building blocks that can be reused independently of each other. But splitting monoliths into services can also lead to major fragmentation. The modern frontend landscape can be overwhelming to navigate. Having to start each project by manually stitching together a multitude of services (build tools, CI systems, CDNs, microservices, identity solutions, API gateways, object stores, etc. ), is not a viable workflow for most teams. WordPress might be an old and creaking monolith, but going to a host and starting a new project just takes one click and you’re set. However, getting hacked or taken down by a surge of traffic is just as easy, and security, performance and maintenance is an ever increasing problem. Just this year in February, 1.5 million web pages across about 40,000 websites got defaced on a single day. In April a separate attack left 120,000 sites vulnerable. Last month, a vulnerability in a plugin left more than 300,000 legacy sites open to attacks. Netlify brings the same kind of one-click setup to the modern web architecture, together with all the advantages of a much better workflow: better performance, infinite scalability and an inoculation against the most common security issues. More than a hundred thousand developers are on Netlify today and thousands of open source projects like Yarn, Lodash, Kubernetes, Docker, Meteor, Apollo, and Hugo have adopted Netlify as a part of their workflow. 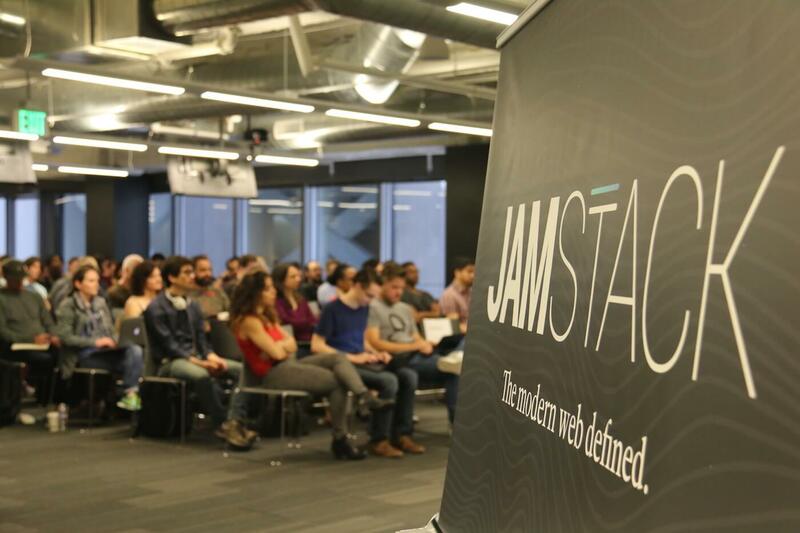 We’re seeing JAMstack Meetups pop up worldwide and modern frameworks like React as well as site generators like Hugo and Gatsby are exploding in popularity. This new round of funding lets us double down on our own contributions to the modern web ecosystem like Netlify CMS, GoTrue, GoCommerce, and all our other open source projects, as well as continue to build out our collaboration tools and infrastructure to support both individual developers and large organizations adopting this new stack. We believe in a decoupled web built on open standards, where performance, security and scalability are strengths of the web rather than weaknesses, and we believe that building a viable workflow around the ideal web architecture is a big part of what it takes. Our new plans and pricing set a new standard for giving all developers access to the same quality of infrastructure and publishing workflows that were once reserved for huge global corporations. We believe we can keep pushing the standard for how the web should be built until the right way of doing things becomes so simple that it’s taken for granted. Peter Levine from A16Z is joining our board and we couldn’t be more excited to start working together. As a board member of incredible companies in our space like GitHub, Digital Ocean and Mesosphere, he brings a wealth of knowledge of how to build great developer-centric companies and he shares our vision of spreading a better architecture for the web. You should absolutely read his blogpost on why A16Z joined up with our cause. We’re also looking for people who are truly passionate about the modern web to join our growing team and help us build tomorrow’s tooling for web developers. Check our careers page for all current openings and and even if you don’t find a matching position, we encourage you to contact us if what we’re doing excites you. Our open source projects, with Netlify CMS as the flagship, are also a great place to contribute to the ecosystem around the JAMstack. Read more on our open source page. We’re looking forward to the next big steps ahead of Netlify and are excited about executing on a large and ambitious roadmap. This begins and ends with the developers using our products and services, and their participation to drive the community forward. To all our existing users, thank you so much for having faith in us and for building incredibly exciting stuff on our platform. To all of you who haven’t joined yet: give Netlify a try! We encourage you to share your thoughts and feedback with us. There wouldn’t be a Netlify without all of you, so truly, sincerely – Thank you!